Born in 1941 in Helmond, the Netherlands in a carpenters family, art was not a regular part of his education during his formative years during and immediately after the Second World War. 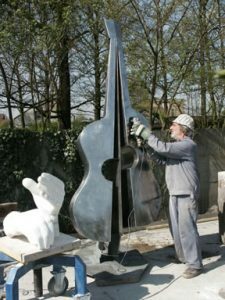 Nevertheless, his attraction to the process of making sculptures as well as the love of using tools and materials are rooted deeply in the atmosphere of his home environment. After studying Chemical Technology he spent a great deal of his working life as a consultant on ecological affairs, and travelled all over the world to battle environmental damage caused by industrialization. These travels, which confronted him worldwide with old architecture and sculpting , in the end made him realise his destiny. Especially his frequent visits to Italy , birthplace of the Renaissance, had a profound influence on him and crystallized his needs to express his feelings into a durable material. Waisting no more time he started off in the early nineties to learn the skills and study the background of sculpting in stone; took lessons of Dutch and Belgian sculptors and travelled many times to Carrara in Italy to improve his skills. Largely self taught and studying a few years at the Academy of Art in Turnhout ( Belgium ), he has dedicated himself to mastering the difficult medium of carving stone and handle modern materials as stainless steel corten steel etc. In his sculptures his roots and technological background , are combined with the influence of old masters and modern shapes. The modern society, with mankind as a focal point is his source of inspiration. Momentarely he lives and works in Beerse , Belgium , between his sculptures, where every art loving person encounters a warm welcome from his wife Irene and himself.